This site has been CONFIRMED for 2018. Serving Time: 9:00 a.m. to 4:00 p.m. Location: Provided on site at Calvary Baptist Church. One of the rewarding ways in which ForColumbia serves its city is by bringing Christians together to serve other churches that are actively working every day in the lives of people in Columbia. Calvary Baptist Church uses its property just off Worley Street in many ways for the benefit of our community, including sharing its facility generously with other organizations. This aging congregation, however, struggles to keep up with the maintenance of its space. We want to offer to make light work with many hands by painting their Fellowship Hall, a common area used in a variety of ways. This is why we think your day will be well spent serving at Calvary Baptist Church. painting six room dividers that are used to make space for multiple different activities within the same area. ForColumbia will provide all painting supplies. Volunteers should dress appropriate for painting. 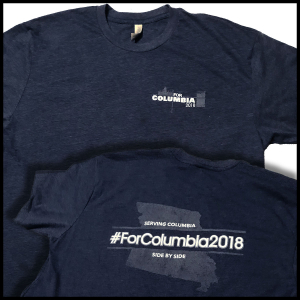 Be sure to wear your #ForColumbia2018 T-shirt! Elementary-aged children should not serve at this site. We ask that all painters be high school age or order.